A week ago, I received an e-mail from the exam committee, stating that my thesis was sufficient enough for Master of Arts in Asian Studies. A few weeks later, another e-mail came to my inbox about graduation ceremony which will be held on the second week of April. I will graduate on April 8th, 2016. It felt surreal. I felt like it was only yesterday when I experienced massive stress when my supervisor told me that I had to revise my thesis. I was so happy, though. Super excited because I had done what I thought I could never accomplish: graduating. Therefore, this marks my last post in TheLeidener. TheLeidener has taught me plethora of lessons, especially in writing. I was never confident enough to write articles in English. Guess what? 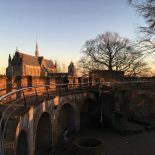 I finally dared to write one article to TheLeidener. An article became two, two articles became four, and so on. From TheLeidener, I have gained a lot of knowledge through posts written by fellow student bloggers. Thank you, TheLeidener. Thank you for allowing me to be a part of a great student blog. I will miss writing on this website, but I will never stop reading this blog. This blog is truly the front line for international future students who want to know what it’s like living in a lovely city called Leiden and studying in the first university in the Netherlands. This entry was posted on March 24, 2016 by in Crystal, Student Life and tagged goodbye post, last post.